Every year I look forward to the months after the Christmas holidays, because unless storms have ravaged agricultural areas, the produce in markets only gets better and better. That is, of course, until the wicked heat of the summer months brings it all to a sweet end with all those fabulous tropical fruits. 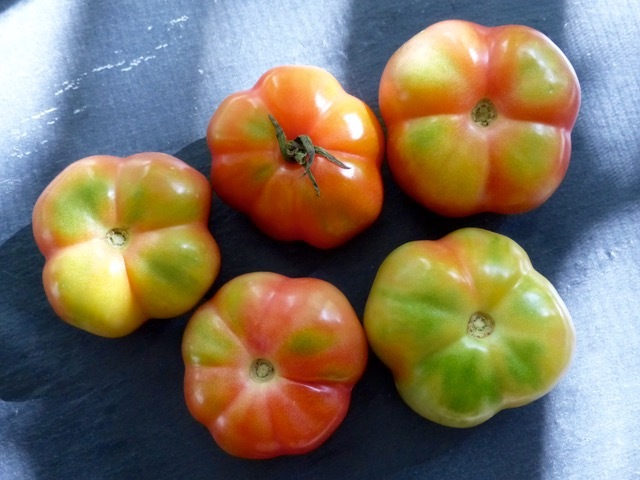 These beautiful native “heirloom” tomatoes are one of my favorites… with thin skins, tasty and less acidic flesh, I love these in simply thrown together salads, or mashed with some bagoong and lasona for a classic Northern condiment called KBL. They are starting to appear in markets now. Other older posts on native tomatoes here, here and here. Wow, those are expensive here in Texas. Great news! These are much tastier than photogenic yet bland beef/beefsteak tomatoes. Tomatoes are native to Central and South America. I bought a couple plastic bags of this for 45php/kilo a couple of days ago. Delicious when (s)mashed by hand, with a good bagoong alamang and/or salted eggs with cilantro then eaten with lots of steamed rice. Diet food, this is not! The most importunate curiosity can’t budge me to try usually gougy priced heritage tomatoes although I’ll go as far with hothouse ones sold on the vine. This is why fellow readers of this blog such as BettyQ make me envious when they share pictures of their first harvest http://goo.gl/QKWFo8 (although they stir the opposite sentiment from me come late summer when for sure they get inundated with rapidly ripening tomatoes.) Anyway, these naturalized Filipino tomatoes of the current post have been obviously passed by by the gene technologists, those busybodies who bred away all that made freely pollinated strains delicious in exchange for size uniformity, long shelf-life and durability in transit. It was the horticultural equivalent of Faust. beautiful. my mom loves to put them on top of just-cooked rice to soften them up a bit before mashing them with salt or patis.